Ireland opened their RBS Six Nations campaign with a convincing win over Scotland, leading from the 22nd minute and stretching away, out of sight, in the second half. The Ireland pack stole five Scotland lineouts and two Scotland scrums and unlike last year’s clash between these two nations, they manufactured scores from their possession rather than squandering it. A try from Andrew Trimble put Ireland 11-3 up at half-time and further tries after the break from stand-in captain Jamie Heaslip – called upon to lead the team after Paul O’Connell dropped out with a chest infection – and Rob Kearney were more than enough for Ireland. Scotland’s best chance of a try came when David Denton was bundled into touch in the right-hand corner on the half-hour. Incisive running from Stuart Hogg and Sean Lamont made inroads into the Ireland defence but could not break it completely. 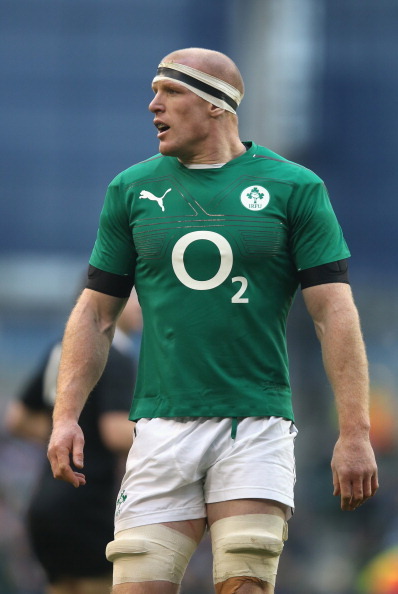 Ireland – Tries: Andrew Trimble, Jamie Heaslip, Rob Kearney. Pens: Jonny Sexton (three). Cons: Sexton (two). – Ireland full-back Rob Kearney celebrated his 50th cap with a try, while Brian O’Driscoll became Ireland’s most capped player of all time, playing his 129th Test. – Leinster prop Martin Moore made his Ireland debut, coming on for Mike Ross in the 63rd minute. – Scotland’s Stuart Hogg and David Denton were the joint top ball-carriers in the match, with 13 each. 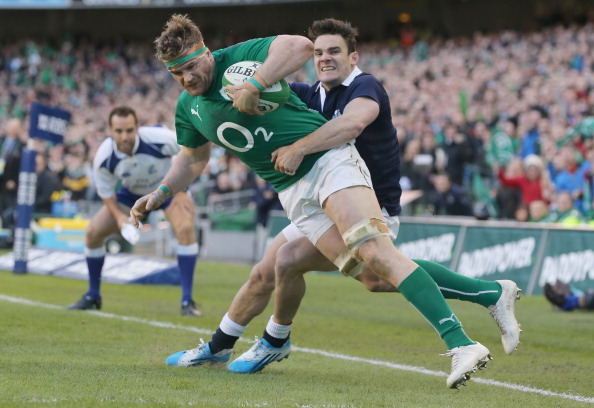 Ireland’s best carrier was RBS Man of the Match Jamie Heaslip, with 11. – Three players topped the tackler charts en masse – Brian O’Driscoll, Kelly Brown and Tim Swinson, with 14 each. – Sean Maitland limped off in the 32nd minute after an aerial clash with Dave Kearney. He appeared to suffer a knee injury and a possible concussion and so is doubtful for next Saturday’s Calcutta Cup game. – For Scotland it’s the same old problem: finding a way to turn possession and half-chances into points. Coach Scott Johnson was pleased with the way they disrupted Ireland in the first half-hour and with their approach play, but frustrated at their inability to cross the try-line. 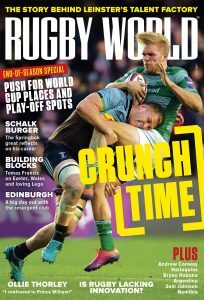 – In many ways it was a good day at the office for Ireland but they did concede ten turnovers to Scotland so will be trying to tighten up the breakdown area before they take on Wales next weekend. – The loss of two scrums and five lineouts was a disappointment for the Scotland pack, so they will need to be more secure in their set pieces next weekend. Rob Kearney; Andrew Trimble, Brian O’Driscoll, Luke Marshall, Dave Kearney; Jonathan Sexton, Conor Murray; Cian Healy, Rory Best, Mike Ross, Devin Toner, Paul O’Connell, Peter O’Mahony, Chris Henry, Jamie Heaslip. Paul O’Connell will return to the second row assuming he recovers from his chest infection in time. Ireland may not make any other changes to their winning team. Stuart Hogg; Dougie Fife, Alex Dunbar, Duncan Taylor, Sean Lamont; Duncan Weir, Greig Laidlaw; Ryan Grant, Ross Ford, Moray Low, Tim Swinson, Jim Hamilton, Kelly Brown, John Barclay, David Denton. If Sean Maitland is not fit, Dougie Fife could step up from the Scotland A side to the first team. The back row could be reshuffled, with John Barclay coming in at No 7, Kelly Brown moving to blindside and Ryan Wilson dropping out.